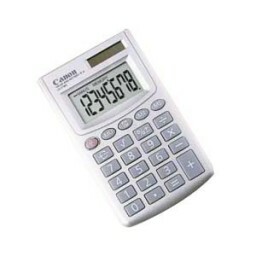 Canon LS-270H Handheld Calculator - 8 Character(s) - LCD - Solar, Battery Powered - 0.4" x 4.0" x 2.4"
The LS-270H handheld calculator was designed to fit your everyday calculating needs. With a large 8-digit liquid crystal display, dual power source and advanced calculating functions, enhanced by an attractive metallic satin finish, the LS-270H has a rich look at an affordable price. Great size. WiIl fit in the pocket without issues. Its about 2/3 the size of a regular calculator, and slim to boot. Seems to work just fine. Small and has a clear display. Perfect for my 8yo to take to school. Generally, I like rubberized keys on something this small. When tapping quickly, my fingers sometimes slip. Other than that, it is a good calculator. I bought mine back in 2003 and I've been using it till now 2015. So, it has been 12 years, good for add, minus, multiplication and division. But, scientific calculator is good for sin, cosin and tan. I bought this calculator five years ago and only used it periodically. It is very light, has a large display, and the keys are have a good feel to them. Unfortunately, it developed a short and no longer functions. great price, easy to type in numbers, large display, easy to read, best simple pocket calc I have ever owned. I keep track of our grocery spending in order to stay on a budget. Also, I'm trying to earn as many reward points as possible by taking advantage of various coupons and discount offers. But I'm not good with numbers, so I need a good calculator.